Everyone at Stan's Roofing and Siding was good. I was happy to have new siding and a new roof. Eric was exceptional and always followed up with any of our concerns. Ross and the installation team were very professional and took great pride in their work. They showed professionalism and promptness throughout the company. They did an excellent job from start to finish. "I was very impressed w/the crew especiallyEric Rhodes, he was very informative. I really would recommend your company.☺Have a..."
I was very impressed w/the crew especiallyEric Rhodes, he was very informative. I really would recommend your company.☺Have a Merry Christmas & A Blessed New Year. Stan's Roofing & Siding has been serving Southwest Suburbs of Chicago with quality exterior remodeling services for two generations. Customers have come to know us for our professional, courteous service. We use quality products and offer great warranties. But it is the expertise and high quality service offered by our crews that have earned us such a strong reputation. No matter what your home improvement needs entail, we have the experience necessary to make your project a complete success. Our customers are constantly referring their neighbors to us for their home improvement projects because our crews will work with you to ensure that you project is done efficiently and effectively. For over 40 years we have been the area’s home improvement leader, and we plan on continuing that tradition well into the future! Kevin Bumstead continues his family’s legacy by owning Stan's Roofing & Siding. 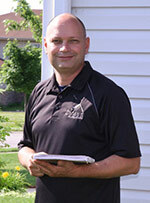 Kevin Bumstead started in the family roofing and siding business when he was 12 years old. After school he would help his dad’s crews clean up at the end of the day. Kevin formed a strong work ethic that he carried over when he served in the Army for 4 years as a Military Police officer. After the Army, Kevin came back to work in his dad’s business, where he eventually took over the reins when his dad retired in 2004. Kevin’s wife Debbie joined the business when Kevin’s mom retired in 2007. Outside of Stan's Roofing & Siding, Kevin and Debbie are the parents of 4 children, Zach, Luke, Jake, and Mya. Kevin and Debbie take great pride in helping out in all aspects of their kids’ lives, from sports, to school work and active participation in volunteering at the school and church. They hope that between their 4 children and 13 nieces and nephews, Stan's Roofing & Siding will continue for generations to come. Stan's Roofing & Siding strives to provide Chicago area homeowners with personalized, quality home improvement services. With expertise in the full spectrum of home improvement projects, our family can help your family realize its dream of a safe, comfortable, beautiful home. For over 40 years we have been helping families turn this dream into a reality, and we hope to do so for many years to come.